Coming soon...your very own future King and Queen of England! This lovely peggie couple represent Wills and Kate on the announcement of their engagement complete with the wow blue and diamond engagement ring (in the form of a Swarovski crystal), and Kates now famous blue dress. 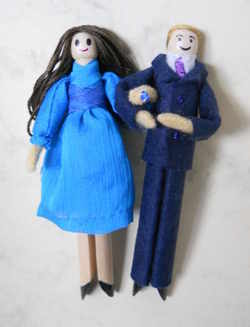 These dolls will be available as kits and will come with everything you need to make the dollies including high quality midnight blue felt, blue chiffon fabric, Swarovski crystal, beads, embroidery thread, and organza ribbon. Full instructions will be included with options to glue or stitch your dolls. These will be available soon from my shop.